A 24-hour view. Resources are listed on the left. 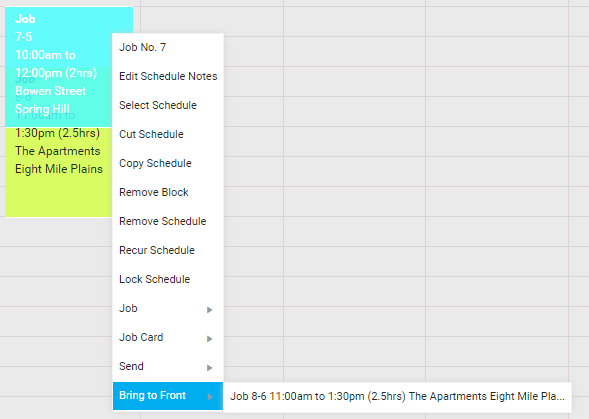 Create a schedule by dragging horizontally. A seven-day view. Resources are listed in their own sections. The first day of the week is shown as defined in Schedule Defaults. Create a schedule by dragging vertically. A month-long view. Displays all schedules for all resources. Useful for companies with smaller workforces. Displays project job schedules. Jobs are listed on the left. Schedules can be filtered by a range of options. Based on timesheets. Choose a resource to show their schedules for a chosen week. Use to manually enter hours or add additional schedules. 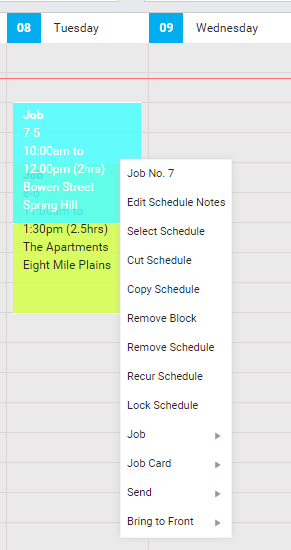 Schedules are colour-coded by their status, unless otherwise defined in Schedule Defaults. Use the Legend at the bottom of the page for quick colour code reference. Click on the day you want. Click on the arrows either side of the month. Click the date itself to open a calendar to choose from. Click the single arrows to move the week forward or back by a day. Click the double arrows to skip forward an entire week. In Month View, Manual View and Project View: click the arrows either side of the month or week. In your chosen schedule view, click Filter. Using the drop-down lists, select an Employee, Cost Centre or Team to filter by. Job No. / Quote No. Open the Job Details or Quote Details card. Add notes for the technician for that schedule. These notes appear in the Job Details card and in Connect. Cut the schedule block to paste it elsewhere. When a schedule is cut, a resource's remaining available hours appear below each day on the calendar. Copy the schedule so you can paste to additional resources or multiple days. Only appears after a schedule has been cut or copied. Only appears on a recurring schedule. Click to stop the schedule recurring. Prevent unauthorised users from moving the schedule. A small padlock appears in the right corner of the schedule bar. Only appears when the schedule has been locked. Click to unlock. Delete the selected schedule block. Delete all schedule blocks for the selected lead , quote, job or activity from that day and resource. Edit, map site, update stage / status, or change project manager for that job or quote. View, print, email or approve the Job Card. Send a schedule SMS, email appointment, or Connect notification to a technician, depending on your System Setup. Only appears with two or more overlapping schedule blocks. Bring one of the overlapping blocks to the top to view, edit, copy etc. When two or more blocks overlap in a resource's schedule, a Conflicts Detected alert appears. Click the block you wish to bring forward. You can then move it, or right-click for a range of options. If a block title is too long, it is abbreviated with '...'. A simPRO build can only use a single time zone. To select your build’s time zone, go to System > Setup > Defaults > System. For example, if a user in one time zone schedules a job at 9am, and the technician is in a time zone that is one hour ahead, the job shows up in the technician’s schedule for 9am and not 10am. To operate over multiple time zones, purchase multi-company to set up franchises with differing time zones. Learn about multi-company in Multi-Company. Try Walk Me Through, our step-by-step guidance tool, to view the schedule. In simPRO, go to Help > Walk Me Through and search Schedule Overview (ID: 97743).